Tonight I participated in the miracle of Terry Riley’s 'In C' (to borrow an expression from Louis CK) at Carnegie Hall. 'In C' is an amazing piece. 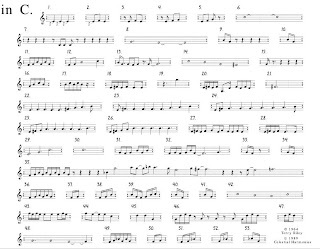 This is what the score looks like: The rules of the game are as follows: All performers play the same page of 53 melodic patterns in a sequence but with each musician having the freedom to determine how many times to play a specific sequence before moving to the next. Any kind of instrumentation is possible.